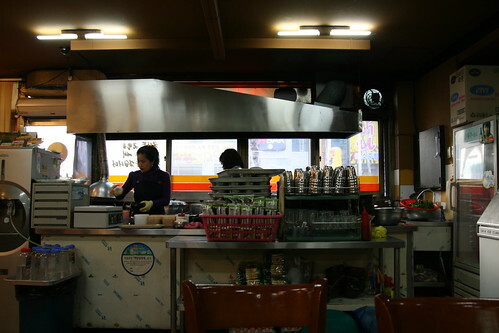 Down by the 리젠트관광호텔 (Regent Tourist Hotel) in 광주 (Gwangju) is a bustling little restaurant that's open twenty four hours a day. 별미집 (Special Taste Restaurant) has only four items on the menu: 콩나물 국밥 (beansprout and rice soup) at 5,000 won, 돼지불고기 (grilled pork) at 8,000 won, 데친 오징어 (boiled squid) at 3,000 won and 모주 (home made alcohol) at 1,000 won. The side dishes may all be red (never a great sign in most Korean restaurants), but the main courses are surprisingly good. 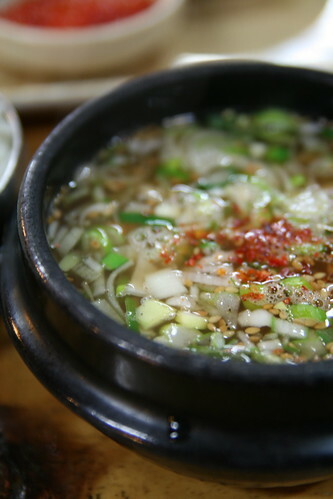 The beansprout and rice soup can come spicy or not. I went for the toned down version, which still had quite a kick to it. Kimchi, squid, spring onions, rice and beansprouts are all unceremoniously dumped together in a hot stone bowl and covered with a simple broth. 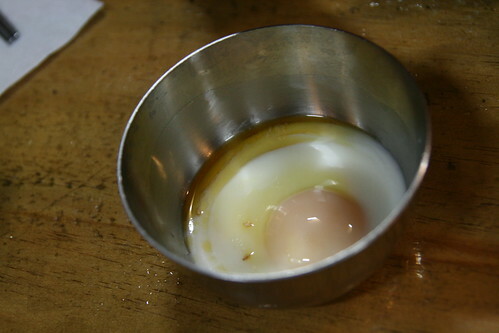 Eggs are on hand to be stirred into the soup if desired and packets of dried seaweed are ready and waiting to be ripped up and sprinkled on top. 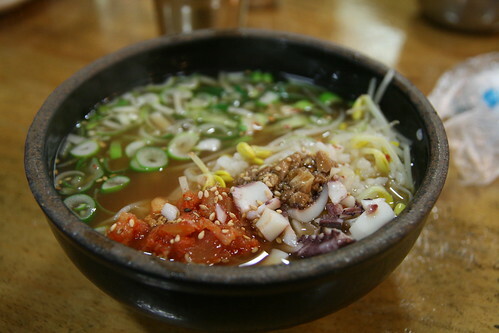 This soup is just about the best Korean breakfast I can imagine. Not too spicy, but with enough of a punch to brush away the morning cobwebs, this hearty broth is a fabulous hangover cure. The grilled pork is great for meat lovers, but may be best served at lunch or dinner rather than breakfast. The fatty belly meat is ever so slightly charred and covered in a sticky red pepper sauce. 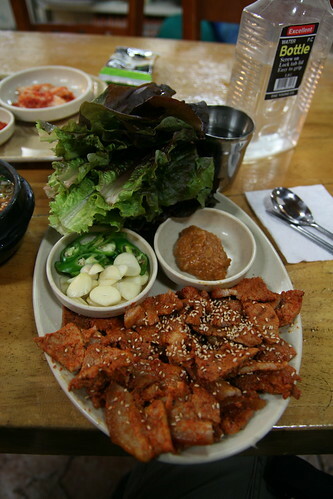 The holy trinity of korean barbeques (lettuce, raw garlic and fermented soy bean paste) is served alongside the pork, but a bowl of rice will set you back another 1,000 won. The pork comes with its own small bowl of beansprout soup, but can also be a great dish to share if you and your loved ones are hankering after the 콩나물 국밥. The restaurant is just across the road from the Regent Tourist Hotel and can be contacted on 062 374 2131. Apologies for the lack of an outside picture, sometimes I can be a rather forgetful and foolish ajosshi.